With the U.S. Open golf tournament quickly approaching, University Place will soon only be known for its stunning links course at Chambers Bay. 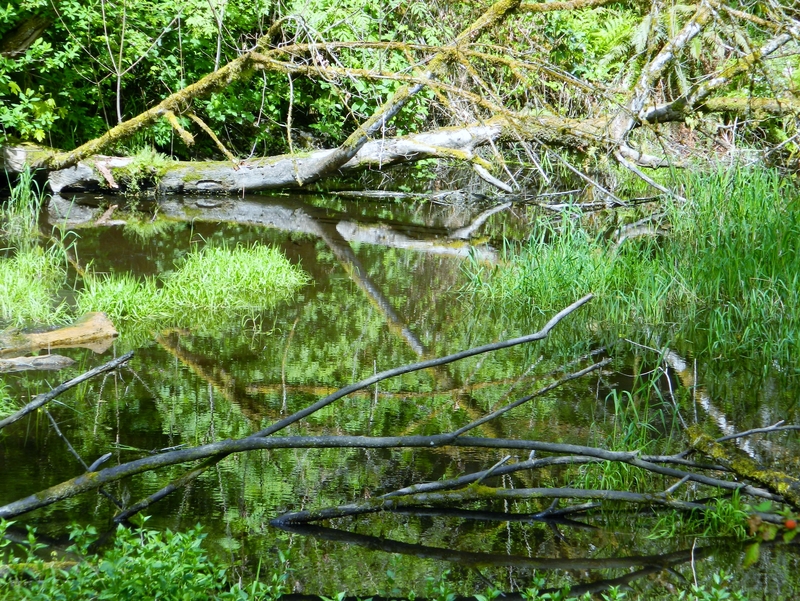 The confluence of Chambers Creek and Leach Creek in Kobayashi Park in University Place. But if you are looking to get away from the crowds that descend on the park surrounding the golf course every time there is a speck of sunshine, or the temperature soars above 50 degrees, then head just a bit east for a hidden gem called Kobayashi Park. 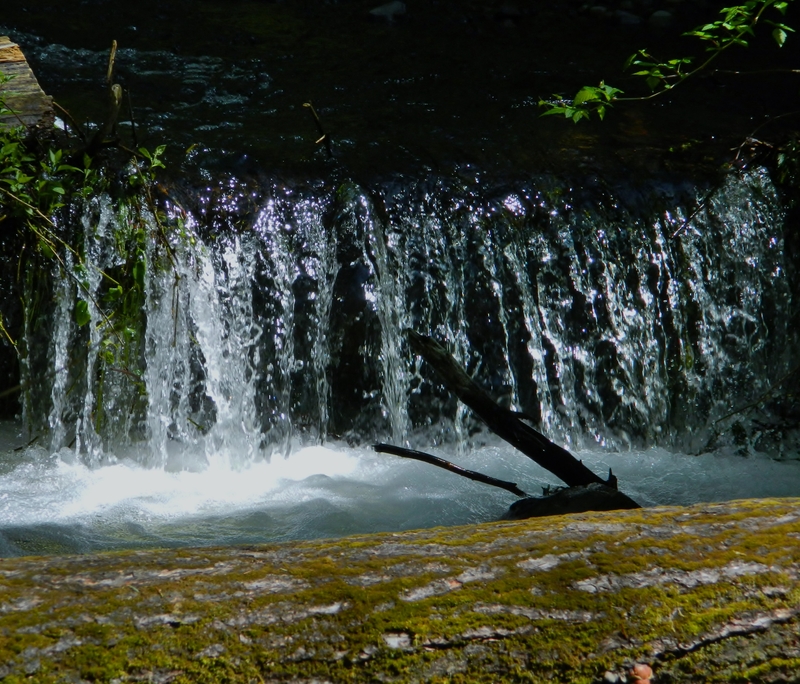 A beautiful little waterfall on Leach Creek, which joins Chambers Creek in Kobayashi Park. 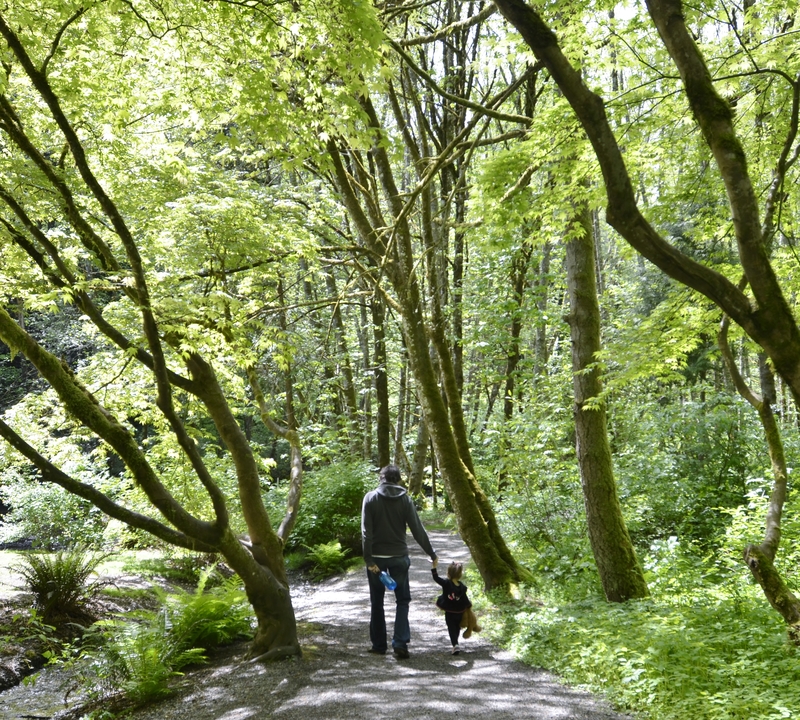 This 5.5-acre city park is nestled into a ravine located just off busy Bridgeport Way, near Fred Meyer. Despite being near a busy road, you can’t hear it over the rushing water of Chambers Creek and Leach Creek, which join together before rushing down the hill into the Puget Sound. On a recent Sunday, we decided to take a quick peek at this park and see what it has to offer. Craig and Catarina enjoying the trail at Kobayashi Park in University Place. It’s a kid-friendly environment, though younger kids need to be watched because of the fast flowing creek. There are 10 parking spots or so at the bottom of a narrow, steep, one-lane road into the park. There is a large picnic shelter, an outdoor fireplace (which doesn’t appear to be open to the public) and bathrooms. The structures are part of the former Kobayashi House, which according to The News Tribune was built in 1964 in a traditional Japanese construction for a Weyerhaeuser executive and later sold to the Kobayashi family. In 2000 according to The News Tribune, the Kobayashi family offered the home to the city when the family planned to move to Japan. After years of vandalism and eventually a fire, the house was converted into the structures you see today. Kobayashi Park in University Place features two picnic shelters, numerous benches and grass areas to enjoy the peaceful surroundings. But the former house makes up just a small part of the wonderful park. There are trails heading in both directions from the parking lot, with one going upstream next to Leach Creek and into an evergreen forest. The other, which is the main trail, heads downstream following Chambers Creek, eventually dead-ending at a peaceful spot along the river. 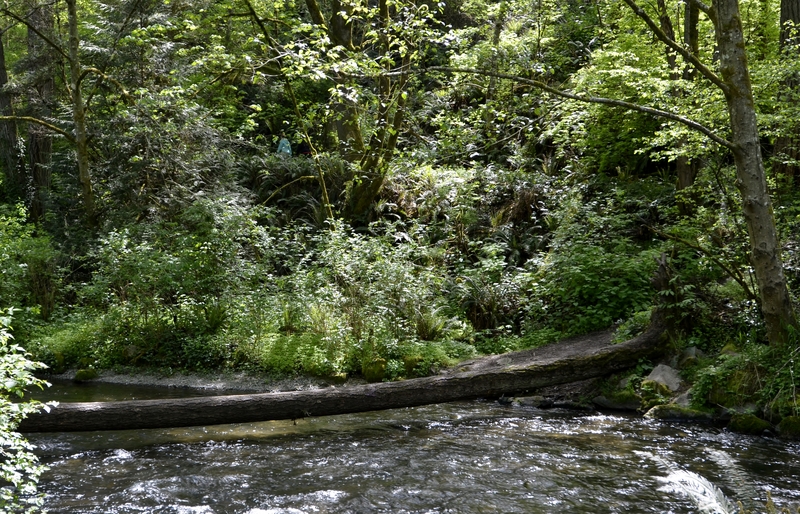 There is more than just the flowing creeks in Kobayashi Park. There are also wetlands filled with creatures and fallen creatures. There are also trails heading up the hill toward some houses on the bluff, though we didn’t go up those. There is also a large log that has fallen over the creek and is used as a footbridge, with more trails on the other side of the creek. We didn’t attempt this as we had our not-quite 2-year-old daughter Catarina with us, but we watched some folks do it – and we plan to eventually try it out. There are paths on the other side of Chambers Creek, and the only way we could see to get to them is by crossing this log. Be careful, as the water flows fast and is somewhat deep underneath it. There are also picnic tables, and benches at different spots along the creek, offering a nice place to relax and listening to the sounds of the bubbling creek, myriad birds and the quiet sounds of nature all in the middle of an urban environment. 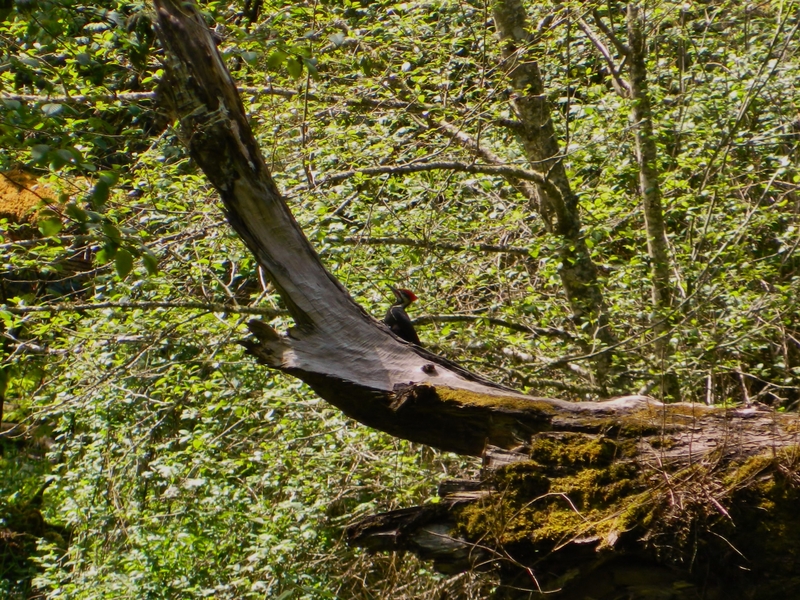 This woodpecker was a bit farther away than my camera lens could handle, but you get the gist. Really pretty bird. I’ve seen a pair of them in my backyard before as well. I’ve also been told that the park is gorgeous in the fall, which makes sense with all of the deciduous trees strewn throughout this wetland and woodland. I foresee a trip back to the park in autumn as that is Veronica’s favorite season. Location: Just off Bridgeport Way near the Fred Meyer on the southern edge of University Place. Directions: Head south onto 67th Avenue West from Bridgeport Way, take immediate left onto Chambers Creek Road, then look for the park sign and turn right onto Kobayashi Park Drive. Fees: None. City park. 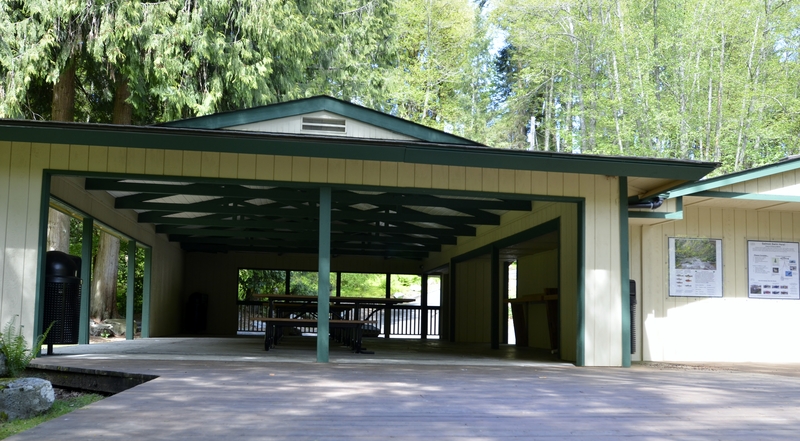 Facilities: Public restrooms, two picnic shelters, numerous picnic tables and benches. Parking: Only 10 spots or so. Activities: Walking, wading and bird watching. Kid-friendly: Definitely, though children need to be kept in sight as the creek is quick moving and somewhat deep. Kobayashi Park is a lovely city park located near the Fred Meyer on Bridgeport Way in University Place. Kobayashi Park in the spring is full of vibrant colors that are augmented by sunny skies – at least it was sunny the day we went. Luckily for us, Catarina loves the outdoors. And right now, she loves sticks – as you can see by what she is carrying in her left hand. This is the view from the end of the trail at Kobayashi Park, at least on this side of the creek. There is a nice open space where you can enjoy a picnic, or just enjoy the scenery. 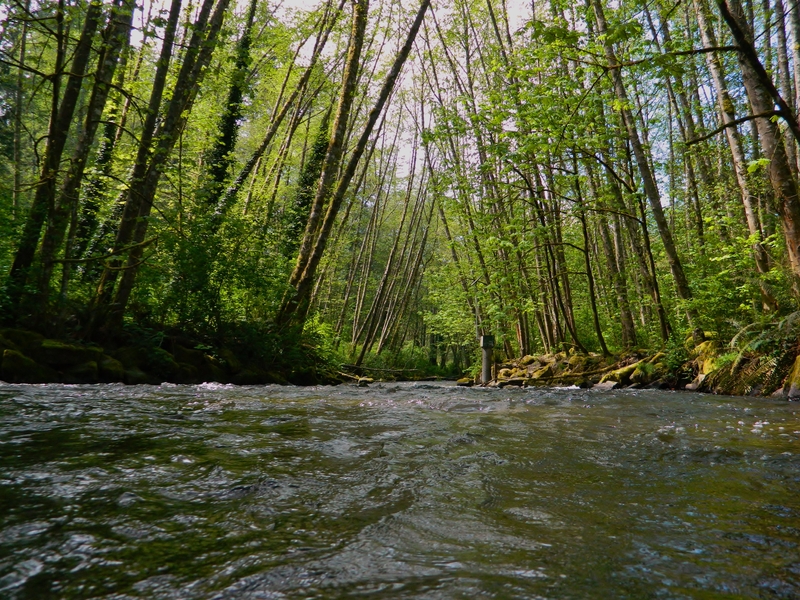 Going upstream next to Leach Creek shows a bit more of a wild environment than the clear path next to Chambers Creek. There are plenty of flowers at Kobayashi Park, including this bush with these stunning pink blooms. Not sure Kobayashi Park is quite lover’s lane, but there were plenty of people professing undying love for each other by carving into the poplar trees. As an aside, I’d encourage folks not to do this.